Sitting at the very heart of the bicycle, the bottom bracket axle was, until very recently, made in high-tensile steel. Strong and rigid, steel is also heavy. Early attempts to replace it with something lighter ended abruptly with Laurent Fignon’s fall near the end of the 1982 edition of Blois-Chaville, as the Paris-Tours classic was then known. Riding solo with some 12km to go and a realistic hope of victory, Fignon was left sprawling on the road when his titanium Campagnolo Super Record axle snapped. Faced with a PR disaster, Campagnolo immediately dropped the titanium axle and went back to reliable old steel. Given that aluminium alloys are particularly unforgiving of poor design and inappropriate application, Magic Motorcycle’s decision to ignore conventional wisdom and machine their bottom bracket axle from the lightweight material was a significant move. With a diameter of 30mm, an aluminium axle can be made stiffer, stronger and lighter than a conventional 17mm thick steel axle. The size increase boosts bending and torsional stiffness to the point that fatigue failure, a major problem with aluminium, is virtually obviated. GXP axle may be expected to offer similar performance. thickness, a steel 24mm axle (as used by Shimano and Truvativ) is about 16 percent stiffer and roughly the same weight. A 30mm diameter aluminium axle of the same weight is about 40 percent stiffer than a 24mm steel axle of the same length – in this case 90mm. 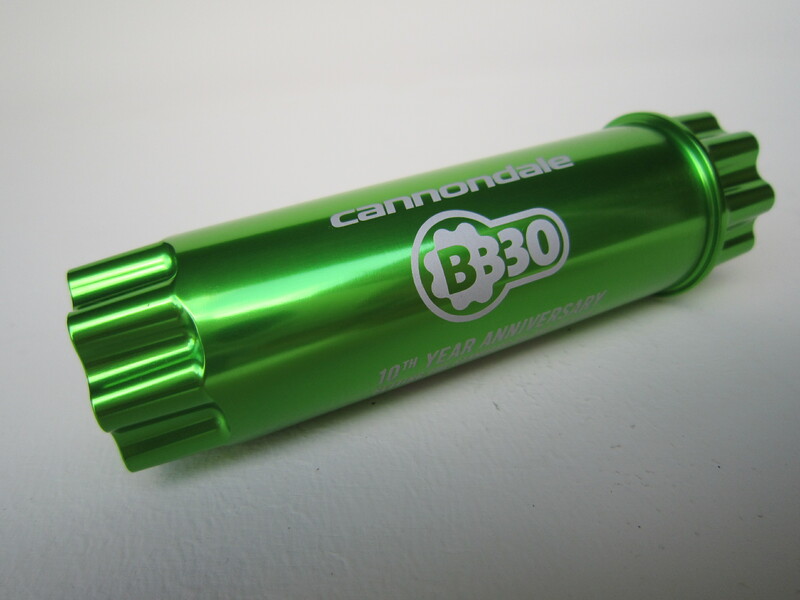 The BB30 axle is about 20 percent shorter – and will be lighter and stiffer by the same amount.